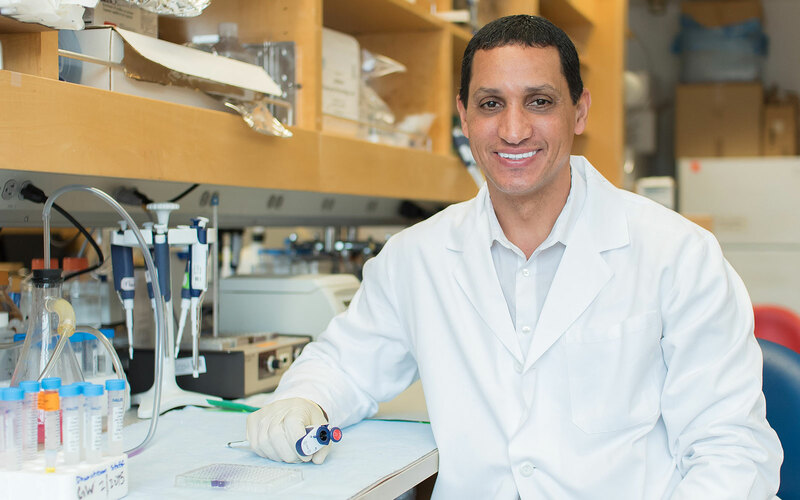 A gift to the Alaoui Lab will support the discovery novel targeted therapies and diagnostic biomarkers for treatment of lung cancer. Steven Rosen, PhD., Professor and Vice-chair of the Department of Anatomy and Hassan Lemjabbar-Alaoui, Ph.D., are developing a novel treatment for lung cancer in a unique collaboration between UCSF and Pfizer. Investigating the role of extracellular heparan sulfate degrading sulfatases (SULFs) in tumorigenesis, and finding novel ways to target them. Discovering novel blood biomarkers for early detection and stratification of thoracic malignancies. Elucidating the molecular mechanisms of multi-drug resistance in thoracic malignancies. Developing DNA repair inhibitors for thoracic malignancies, particularly small-molecule inhibitors, which hold great promise for damaging tumor cells. Adapting cAbl inhibitors, FDA-approved for the treatment of chronic myeloid leukemia (CML), for treatment of malignant mesothelioma, a devastating and currently incurable disease. Our lab employs state-of-the-art molecular and cellular technologies including the Affy-gene Titan high throughput expression analysis and ABI HT 7900 qPCR, and has access to the Thoracic Oncology Tissue Bank, one of the largest repositories of lung tumor tissue specimens in the world. TACE/ADAM-17 phosphorylation by PKC-epsilon mediates premalignant changes in tobacco smoke-exposed lung cells. EMMPRIN regulates the canonical Wnt/beta-catenin signaling pathway, a potential role in accelerating lung tumorigenesis. Use of a phage display antibody to measure the enzymatic activity of the Sulfs. Epithelial-mesenchymal transition in lung cancer: is tobacco the "smoking gun"?. Wnt and Hedgehog are critical mediators of cigarette smoke-induced lung cancer. Tobacco smoke control of mucin production in lung cells requires oxygen radicals AP-1 and JNK. Viral dsRNA activates mucin transcription in airway epithelial cells. Tobacco smoke-induced lung cell proliferation mediated by tumor necrosis factor alpha-converting enzyme and amphiregulin. Platelet-activating factor receptor and ADAM10 mediate responses to Staphylococcus aureus in epithelial cells.